The rooms at Villa Vang Vieng Riverside are bungalow style, but they are solidly built, made entirely out of wood and concrete and feel more like small traditional Lao houses, complete with terracotta roof and decorative trim. Average rating 7.2 from 505 reviews. Each bungalow comes with a big hot water bathroom with bathtub, old cable TV, big bed with soft linen, hardwood floors, air-con and free WiFi. The river view rooms have porches that face the river and mountains. The star is the pool, which is also beside the river; it gleams in the midday sun and beckons weary, hot travellers. This is a pretty little hotel with spacious grounds and a big covered restaurant to enjoy breakfast with a view. Prices have gone up over the years when all other guesthouses and hotels have gone down, but the fixtures have clearly been upgraded and well maintained. 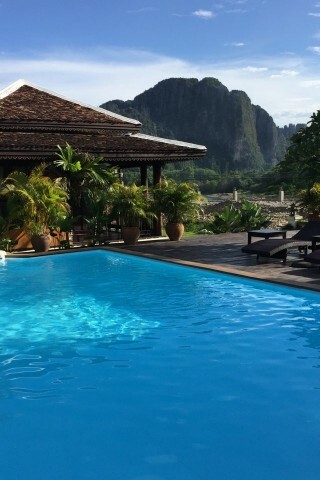 Check rates at Villa Vang Vieng Riverside on Booking.com.